The stone is very dense and tough and nothing seems to damage it. Test results on density, flexural strength and durability support the claim that it is an almost indestructible natural stone. This makes it very versatile. A low maintenance surface. Our customers tell us that "Sofala floors gets dirty but you don't notice it - the grey and gold colour disguises it beautifully". This make cleaning and maintenance less stressful. 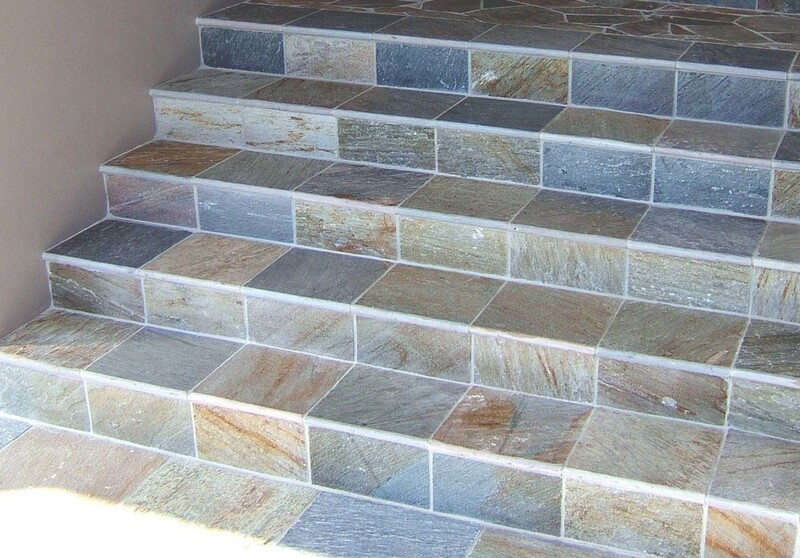 One of our most experienced tilers said that he had laid a lot natural stone but Sofala was one of his favourites because the stone was "dense with impressive quality and almost no breakages and chipping" occurred when he unpacked the crates. 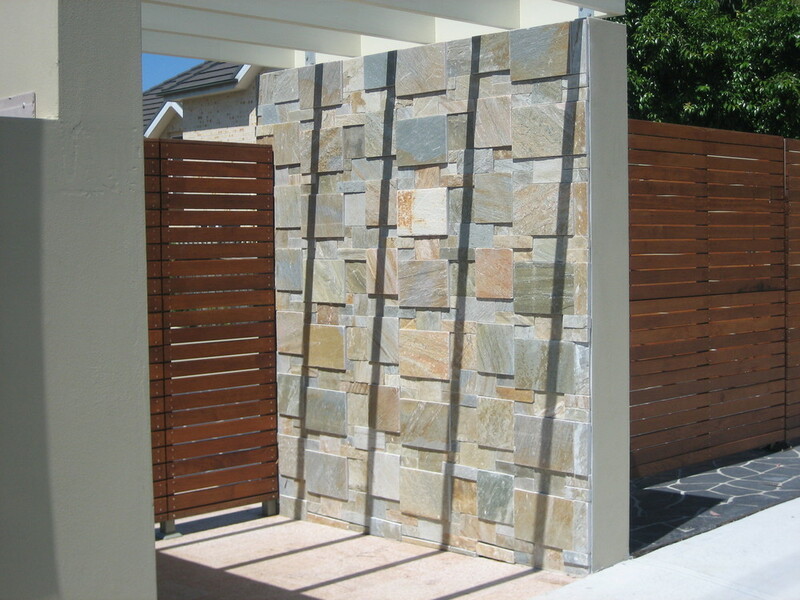 Sofala quartzite has been described as having bright, happy colours that blend easily. 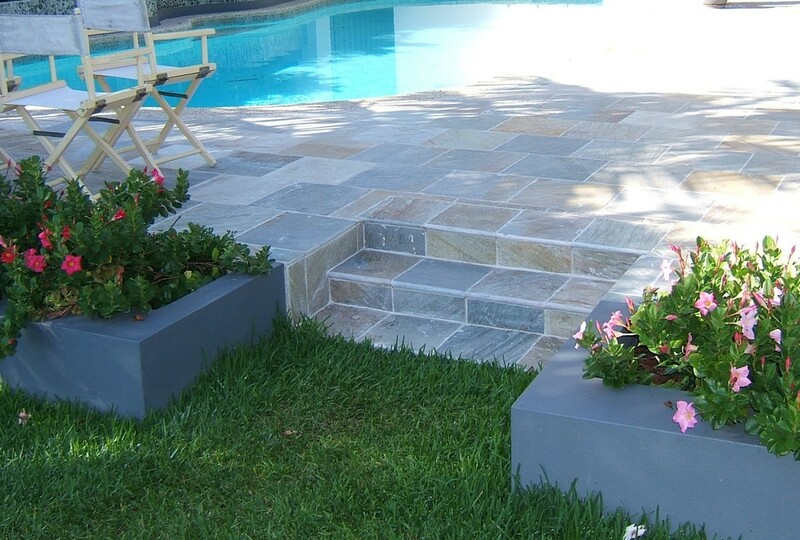 Sofala tiles and pavers contain an array of really appealing colours that liven rooms, verandahs and outdoor areas. According to our customers these colours blend nicely with garden plants, pots and outdoor furniture but just as well with soft furnishings indoors. 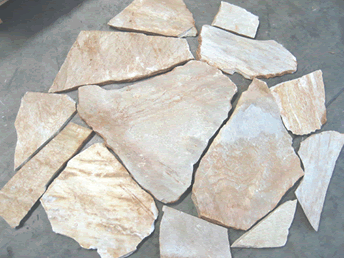 Loose flagstone pieces- variable sizes; thickness 18-40mm. Each crate = 20m2 approx. Each layer in the crates = 1m2 but when laid may be up to 10% less in covered area depending on width of grout joints used. Random pattern - 4 sheets/covered m2, (each 0.25cov.m2) thickness 12-15mm. Sofala outdoor pool tiles in French Pattern, sealed with Sealer's Choice Gold. You can see from the image that this has no effect on the stone colour. Photo supplied by Primo Tiling who did the impressive work for a home in Cronulla. The stone was sealed with a surface sealer that lifts and darkens the colour. NB The benchmarks for use of stone around salt water pools is 0.1% weight loss or less with a minimum slip resistance classification of W.
Recent test results indicate that the level of quartz in this stone has fallen below the ASTM standards to be technically a quartzite, even though it looks like quartzite and cleaves like quartzite! The high level of calcite in the recent samples sent for testing make the stone technically a marble. In the future, we may get dispatches from the same quarry with lower levels of calcite which might make the stone technically a quartzite! Sometimes the changes are not apparent and that is why we get the stone independently tested. Our apologies for the possible confusion - we are just trying to be truthful is describing one of our most popular products that we have been selling for nearly 20 years without a single recorded problem. 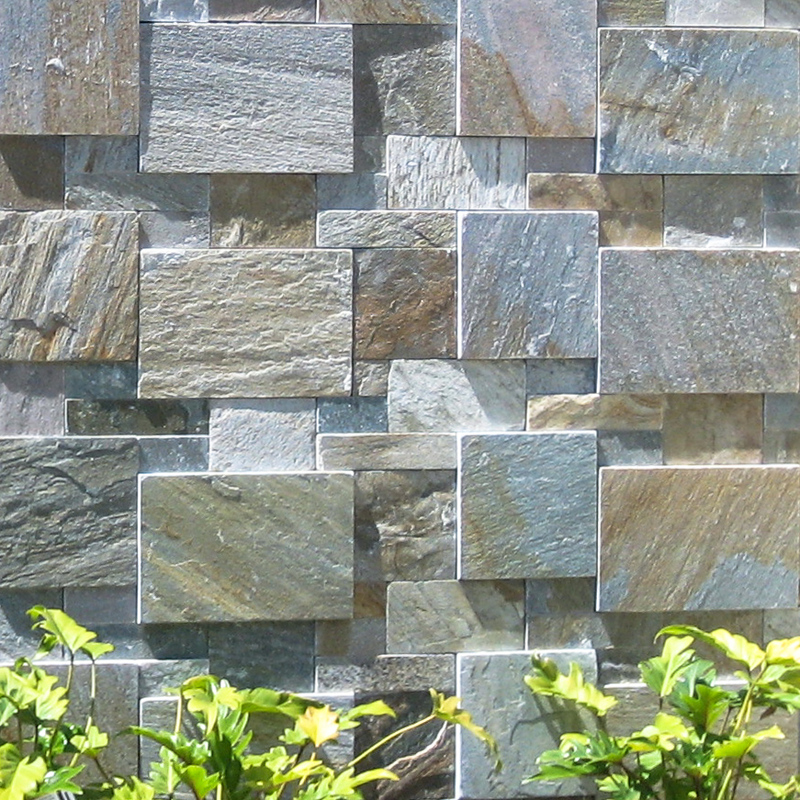 Sofala quartzite is a very durable stone and in most situations does not require sealing. The exceptions are salt water swimming pools and food preparation areas where oils and fat may get spilled and leave marks. Tannins from leaves, bird poop and dog residues are other outdoor threats. Sealing reduces the risk of permanent staining. If sealing is preferred we recommend Sealers Choice Gold Rapid. This sealer is water based, will have no effect on the colour of the stone and should last 10-15 years in ideal conditions. Occasionally, customers select a sealant called Aquamix Enrich and Seal which enhances the colour of Sofala. We at Bellstone prefer the natural look but that's just a personal choice.